In order to explain how I do my work, I thought some pictures would be helpful. Then I decided to go a step further, so I created a time-lapse video of a shipment being processed. The fleet of book trucks has arrived! 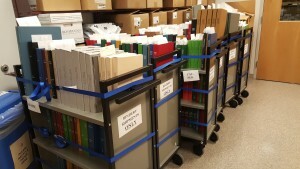 They are brought to us from Wells Library, just in time for the arriving bindery shipment. 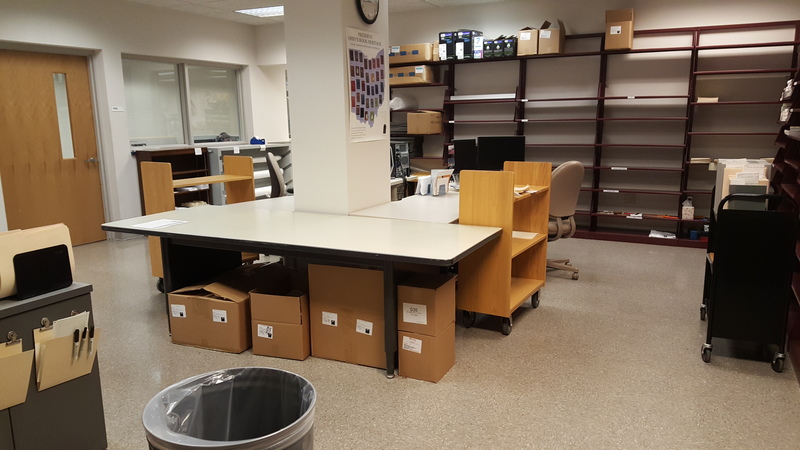 At this point, the big table is empty and the outgoing shipment has been processed and is ready to be picked up. As the Bindery and Preservation Review Coordinator, I oversee the preparation of materials for commercial binding. We send shipments to the HF Group in North Manchester, Indiana every fourth Tuesday. The outgoing shipment is picked up at the same time the previous month’s finished shipment is returned to us. Now the return shipment is being brought in by the HF Group truck driver–ordinarily about 40 boxes. 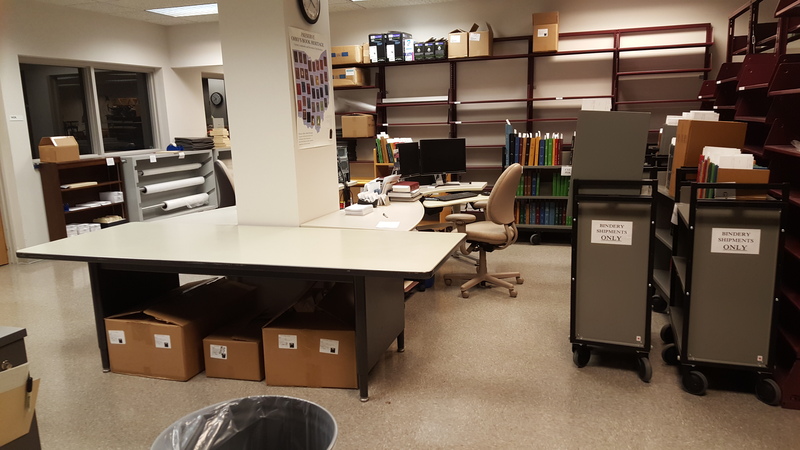 The return shipment must be processed quickly–within a week–so when the shipment comes, my students and I are all working on it. The work pace is quite different than the rest of the month, as materials to be bound are picked up from the various campus locations, and then brought to Wells Library, and finally here in the daily deliveries. 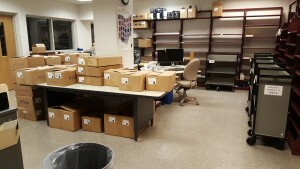 Now that all the boxes have been brought in, everything is in place. 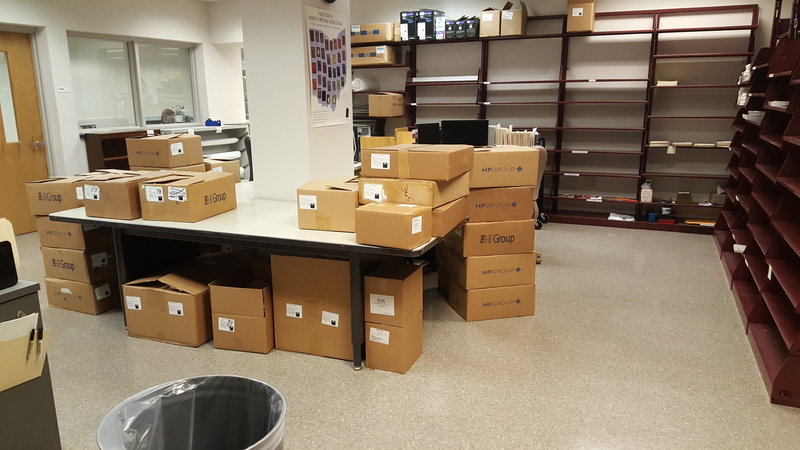 This bindery shipment is ready to be unpacked, checked, and sorted. Here we have begun unpacking. For our assembly-line, we put all the boxes on one side of the table. 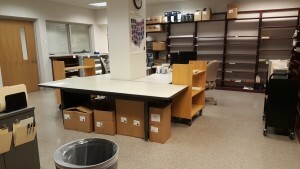 The first person opens the boxes and places the items on the table oriented in the same direction. The second person opens the volume and moves the bindery slip so it is readable when the book is closed. Then, they sort the items based on where they will go next. The third person has stacks of duplicate binding slips and matches them up to make sure every item has come back. Finally, the volumes are sorted onto trucks to facilitate the next steps, which take place in Technical Services in the main library. The time-lapse video was fairly easy to make. I set the camera to take a photograph every 5 seconds. Almost 2 hours later, we had 1,137 photos. I took out about 100 photos and put the rest into an image sequence at 15 frames per second. After exporting the video, I posted it to my (newly created) YouTube channel. The table is once again clear of boxes and books. The day we process the returned bindery shipment feels exactly how it looks in the video. 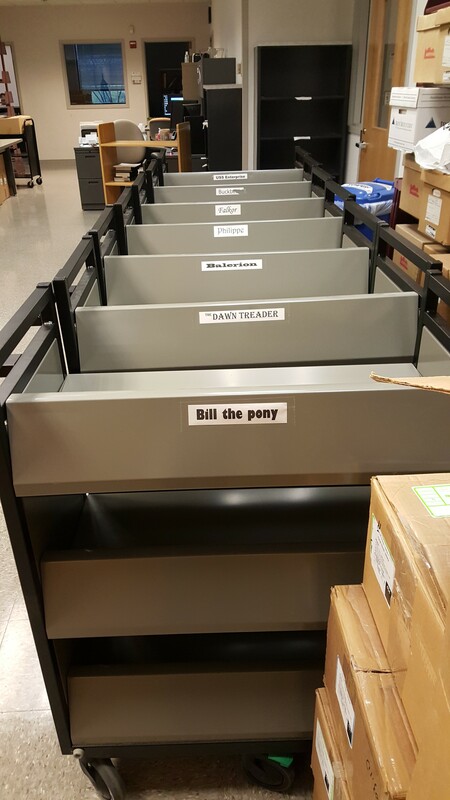 After everything is on the appropriate trucks, we deal with any extraneous problems that need to be handled before the items go back to Technical Services in Wells Library. The items get secured with a strap around each shelf. The trucks are now ready for transport. 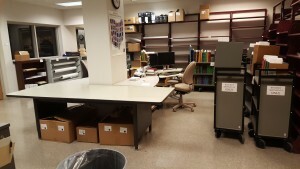 After they leave, the work space seems much larger. It also appears like we don’t have any work to do, but that’s not true. In 3 weeks, the shipment that was picked up will be returned to us, and the whole process starts again. 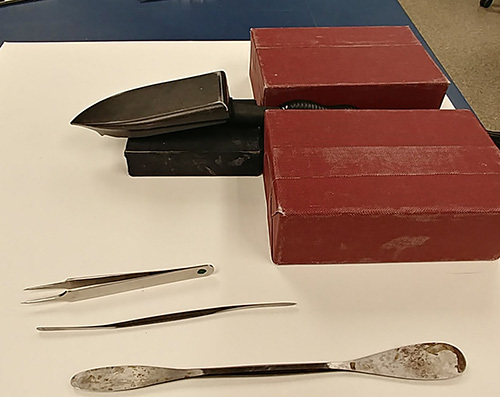 The General Collections Conservation unit of Indiana University Library’s E. Lingle Craig Preservation Lab treats an average of 13,000 items per year. 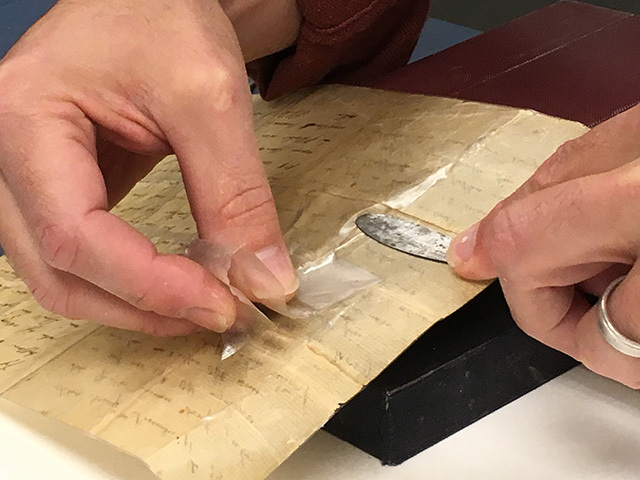 Treatment may be as simple as reinserting single pages that have come loose to completely rebuilding and repairing a 300-year-old monograph. 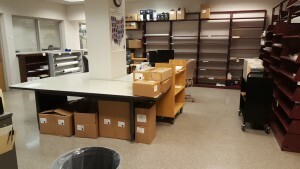 However, several times each year the Lab is sent items in a red biohazard bag; these require special handling or disposal. Often the contents of these bags are books thought to be hosting active mold growth, and the Craig Lab staff is asked to assess the item and decide whether it can be saved or needs to be withdrawn. 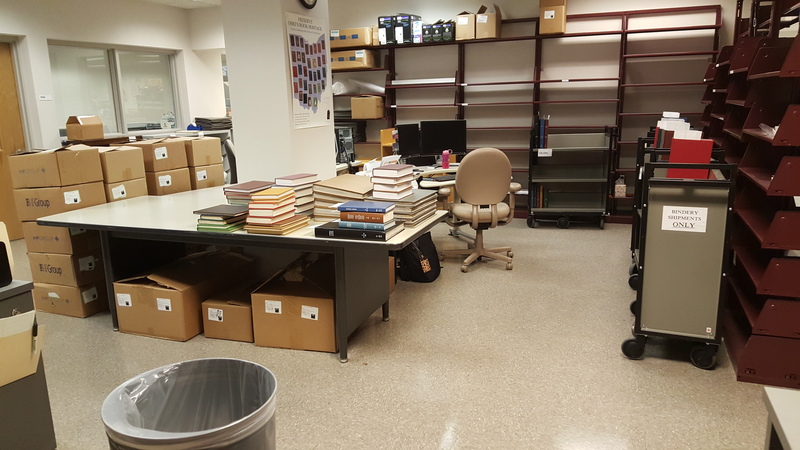 This, Tale of Two Books, is an overview of the steps we follow when a monograph shows up that has mold and will give you an idea of the process we use to remediate this problem when the item is important enough to warrant the time and effort. 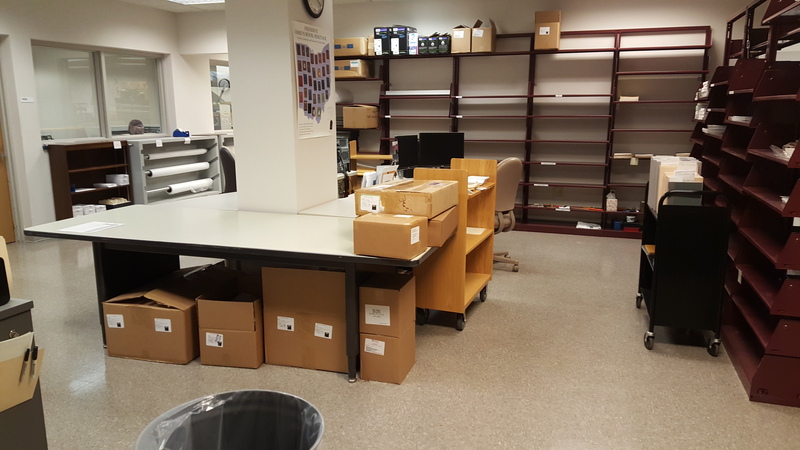 Usually the circulation desk staff will notify the Lab when a book that they suspect has mold is being sent to the Lab so we know to be looking for it. However, sometimes we do not know what the problem might be until we open the bag. Fortunately, red biohazard bags are hard to miss, so when one shows up we know to take special care in handling its contents. While we are not overly concerned with the supposed toxicity of mold, neither are we careless with it. Mold can trigger unpleasant allergy-like reactions and/or contaminate workspaces if its presence is extensive. Also, some books may have other, potentially more hazardous issues. Therefore, the contents of these bags are dealt with either in a controlled environment such as an exhaust hood or outdoors where there is unlimited air exchange. About 25% of the time, the problem that was sent to us as mold turns out to be either just dirt or ink that has run, or a combination of the two. We appreciate this as erring on the side of caution. 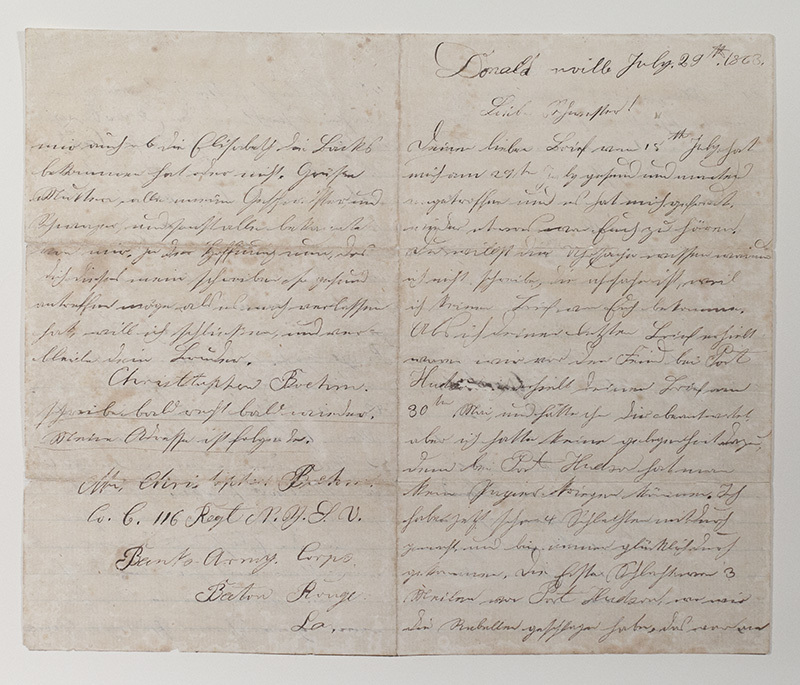 A more casual attitude on the sender’s part could result in our dealing with a major mold infestation in a collection space, so we do not mind receiving an occasional “false alarm” book.